Featuring superstar players like 14-year old SM Josh Colas and 14-year old NM Kapil Chandran, as well as 3-time US Champion guest lecturer Joel Benjamin, the Connecticut-based Chess Club of Fairfield County's inaugural Tri-State Super-Juniors promises to be an exciting juniors event for years to come. Housed in a facility that, according to GM Joel, is comparable in the US only with the famed Chess Club of St. Louis, the CCFC (as they are nicknamed) is a world class venue featuring wifi-equipped parent lounges with monitors that can display games in progress (transmitted through DGT live to the internet), a stunning tournament hall flush with natural light, a resplendent chess library with classic books alongside the latest technology, modern classrooms and much more. 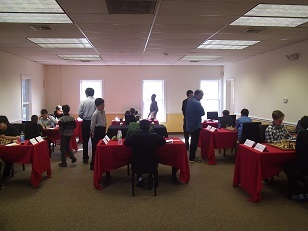 The Tri-State Super-Juniors features only juniors with a USCF rating over 1800, placing them easily in the top minuscule percent of both scholastic players and tournament players generally. The competitiveness of youth events is especially intense as top juniors are usually under-rated, heavily coached, and extremely motivated. This showed as early as the first round with NY expert and CCFC regular Jason Shi taking down 2400-rated Josh Colas in a devastating kingside attack. After the game, Josh admitted that the pressure of these games was palpable. The Club's owners, locally renowned tournament organizer Melvin Patrick and professional educator NM Daniel Lowinger tried to counterbalance the pure intensity of the competition with a jovial atmosphere that included catered dinner and a memorable 2-hour lecture by 3-time US Champion, GM Joel Benjamin. The lecture went nearly a half hour overtime as parents and audience members crowded Joel for autographs and follow-up questions on how best to organize their child's chess education. 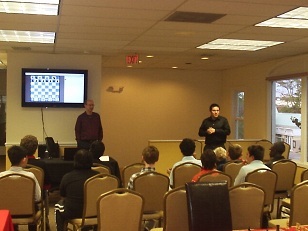 As Mr. Lowinger explained, "Our club's mission is to elevate the stature of chess. We don't want people just to come and go with a passing remark about the elegance of the facility. We want to provide education at a high level. For this there is nobody better than 3-time US Champion and professional chess coach (many time coach at the World Youth Championships, for instance) GM Joel Benjamin. We want to portray chess as a collegial activity with respect for each other and the game. This is the reason for the dress code. I was asked more than once whether we were serious about it and each time replied unequivocally. These kids may be on the world's stage someday representing our beloved game. We want them to start to become conscious of the perception of others toward our game." 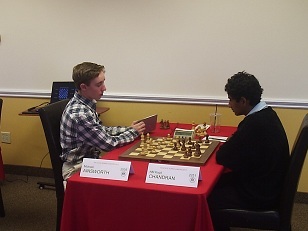 In the end, 2nd seeded NM Kapil Chandran blasted through the field with a perfect score. Kapil is a junior instructor at CCFC and trains diligently with other staff, including NMs Ian Harris and Daniel Lowinger, as well as GM Mikheil Kekelidze. Not long ago he won clear 1st at the Philadelphia International's U2200 section. Presently nearing 2300, Kapil shows no signs of slowing his meteoric rating rise any time soon. His dominant first place result, a full point ahead of a host of the nation's best, is a matter not only of personal, but of community pride at CCFC. Says Director Melvin Patrick, "[Kapil's result] is a testament to the rigorous training we provide here at CCFC for all levels. Beginning with our Dream Team, a K-8 team featuring beginners through experienced tournament players, we provide exceptional training to dedicated students. This carries all the way through master level players like Kapil. If you want the best training, CCFC is the place to get it."